The Ashford 30.1 has a beautiful Cast Iron body which is available in metallic black paint, carbon black paint, colonial pewter paint, stone white enamel and chestnut high gloss enamel. As with the Sirocco 30.1 and the Chinook 30.1, the Ashford 30.1 uses our cleanest burning firebox at 0.8 gms/hour. At 2.75cu.ft. 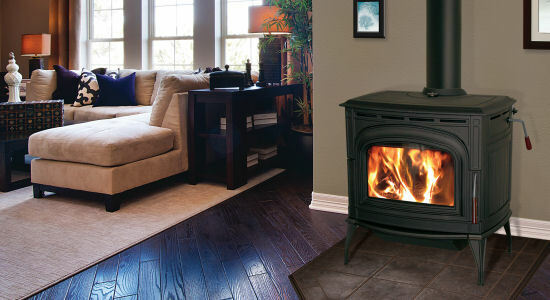 the firebox is large and capable of burning for up to 30 hours on low. The Standard ash pan is mounted on engineered runners for a smooth gliding action and our craftsmen used beautiful burled walnut for our door and bypass handles.